If you have ever grown zucchini in your garden before, you know what it’s like to be completely overwhelmed with an overabundance of zucchini. It’s a good problem to have! 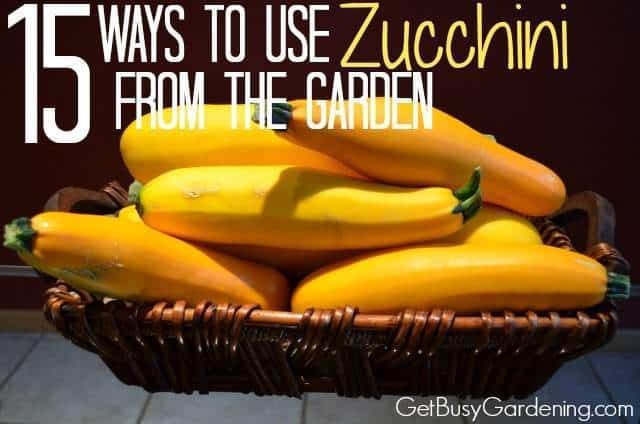 Of course, you could give it away to all of your neighbors, family, friends, strangers on the street… but there are lots of easy ways to make use of that overabundance of zucchini from your garden. 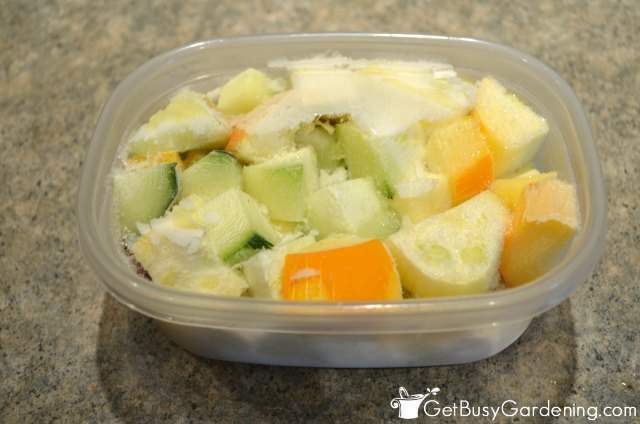 You can use zucchini fresh from the garden now, or preserve it for winter use. It doesn’t matter if you grow green zucchini or yellow zucchini, you can use either of them the same way, or mix them to add extra color to your recipes. Zucchini is great because you can shred it, chop it, dice it, slice it.. there are so many ways to prepare garden fresh zucchini. Plus, no matter how you prepare zucchini, it freezes and dehydrates really well, so you can keep enjoying your homegrown zucchini all year long. 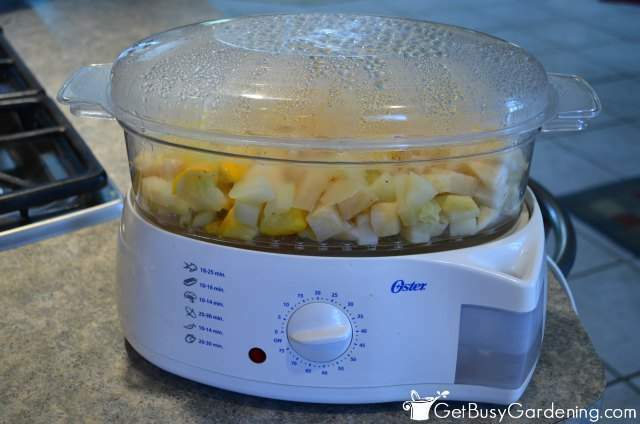 Shredded – Use a food processor to shred your garden fresh zucchini, and then toss it into soups or pastas. You won’t even know it’s in there, and shredded zucchini can be frozen for winter use. Grilled – Zucchini is perfect for grilling. You can add it to kabobs, or grill it in a foil packet mixed with other garden vegetables. 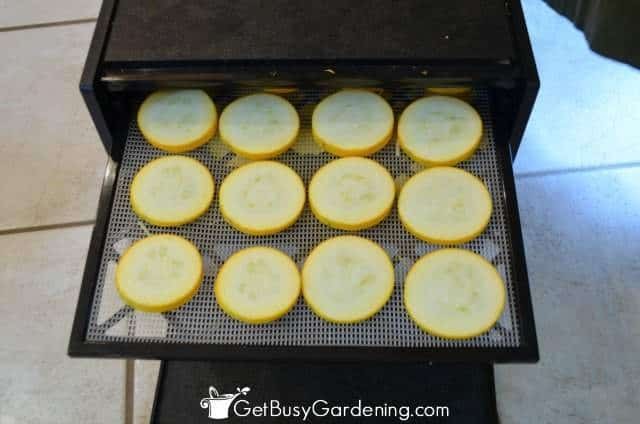 Zucchini chips – Slice zucchini and put in the dehydrator until dry and crispy. Enjoy healthy zucchini chips with your favorite dip instead of potato chips. Yum! Baking – Make zucchini bread, or add shredded zucchini to pretty much any baking recipe, you won’t even know it’s in there. Zucchini for breakfast – Shred or chop up zucchini and add it to your eggs. I like to add zucchini to my scrambled eggs, egg bakes and other breakfast recipes. Steamed – Chop up zucchini into bite sized pieces and steam it. You can steam it by itself or mixed with other garden vegetables. Lasagna layers – Slice or shred fresh zucchini and add it to lasagna. You can substitute it for noodles, or just layer it in. Salads – Shred zucchini and add it to your salad for a little extra crunch, or mix it into your favorite coleslaw recipe. Smoothies – Pulverize zucchini in the food processor or blender, and add it to smoothies or any recipe. 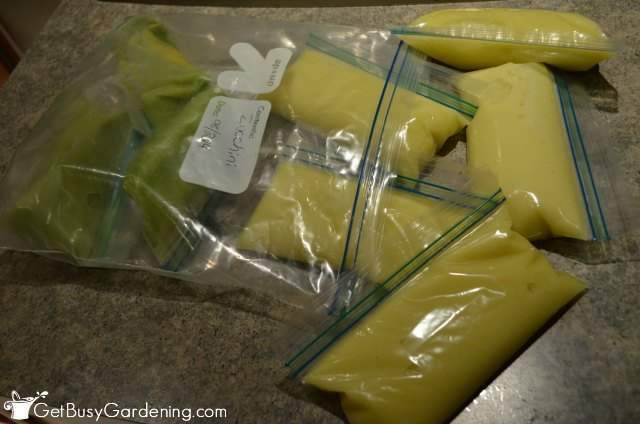 I freeze my pulverized zucchini in baggies, that way I can add it to my smoothies all winter long. Veggie trays – Cut zucchini into sticks or slices, and add it to the veggie tray you bring to your next party. Zucchini is delicious served with veggie dip, hummus or guacamole. Fried – Fry it up in a pan, I like to saute my garden fresh zucchini in butter for a special treat. Freeze for winter – Freeze it to enjoy homegrown zucchini all winter long. I like to chop up my zucchini into bite sized pieces and mix it with other garden vegetables, then freeze it in meal sized portions. Need a quick vegetable to go with dinner? It doesn’t get any easier than this. Pickled – That’s right, you can pickle zucchini, make it into zucchini relish, or add it to other relish recipes. Spaghetti – Make zucchini spaghetti noodles. You can use them fresh, or dehydrate zucchini spaghetti noodles for use during the winter. This is my new favorite way to use the zucchini from my garden. Next time you’re feeling overwhelmed with an overabundance of zucchini from the garden, just think of all the creative ways you can use it. Zucchini is seriously one of the most versatile vegetables, and it can be used in practically any recipe. Leave a comment below and share your favorite zucchini recipes. I have a big garden at my house and I grow a lot of vegetables including zucchini. Great tips and recipes! I will definitely try them! Regards! Please advise if you blanch the zucchini first. 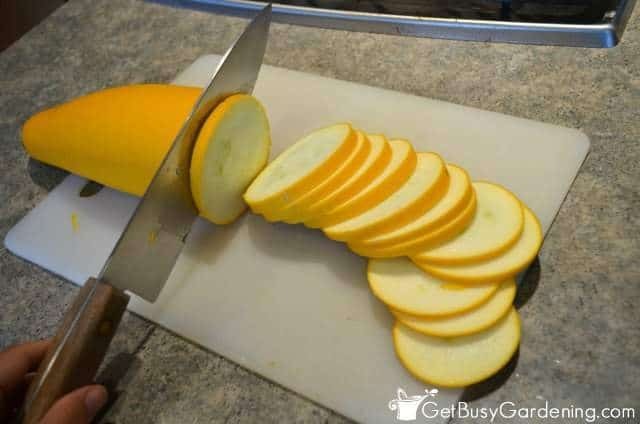 We cut ours into slices, put the slices in small freezer bags. The result was soggy zucchini. Please advise. Yes, dunking zucchini in boiling water for about a minute (not too long though) will help to keep it from getting super mushy in the freezer. It still won’t be the same texture that it was when it was fresh, but it won’t be as mushy as it is when you don’t blanch it. I don’t blanch the shredded zucchini, because I use that in cooking so the texture doesn’t matter.